The E3 LED Task Lamp by UPLIFT Desk provides powerful, directional LED lighting with a dash of modern style. The E3 can sit comfortably on any desktop surface, and the lamp head may be angled up to 175 degrees. Get your E3 LED Task Lamp in one of three color finishes: black, white, or silver. Plug in a USB charger using the dedicated port on the E3's base. You can control the lamp's dimming and color adjustments from touch pads on the base. The E3's lamp head folds down to make for slim, compact storage. Take greater control over your desk's lighting with the E3 LED Task Lamp. The right lighting is as important to your health at work as getting the right level of activity. Get awake and alert at your desk and reduce eye fatigue with the same task light. Stepless color temperature and five levels of brightness adjustment ensure you can tailor your light to your needs and change it as often as you like, to read, work, or study in comfort. Stay focused and reduce eye strain-induced headaches with the right lighting for your task and your eyes. Stop squinting to read small print; just swipe right on your brightness control slider and bring the light up to the correct level for you. Too early in the morning to deal with bright light? Swipe left and dim your lamp. Tap the slider to quickly cycle through the five available presets. With the broad range of available brightness settings, you'll always have the right light. Daylight isn't just one color. It ranges from a cool, almost blue light to a warm red glow. Warmer light signals your body that it's evening, encouraging you to relax, and is easy on the eyes. Blue light can help wake you up, perfect for crunch time - but it can also tire out your eyes if you work under it for too long. Working under a lamp that mimics the full spectrum of natural sunlight with stepless color temperature control will benefit your energy and your focus. A cool color value of 6500K mimics midday sunshine, while a warm color value of 2700K can help you fight eye fatigue and work with fewer headaches. To strike a happy medium, try the natural light setting at 4600K - simply press and hold the power button to move seamlessly through color temperatures until you've reached the value that's just right. Save the USB ports on your computer for your peripherals. 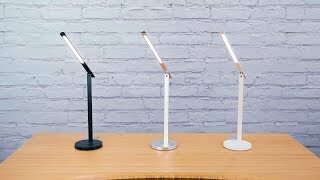 The E3 LED Desk Lamp's contemporary design includes a 5V/1A USB charging port at the rear, so you can easily charge your phone or other devices. The lamp's aluminum surface stays cool to the touch as you use it all day, and matches your office style in your choice of a black, white, or silver finish. Illuminate and decorate your office with the E3 LED Desk Lamp. What's a task light? Do I really need one? If your tired eyes need a break, you could use a task light! Task lighting is directional light trained on the work you're doing, to give you less eye strain with appropriate light for the task at hand. If you need more or directed light for your work, or you find that your eyes get tired, a task light can help you. Work with fewer headaches and less eye strain and fatigue. An adjustable task light will give you the best brightness, color, and angle for what you're doing. Just like sitting with good lumbar support and periodic standing at your desk is good for your body, the right light is good for your eyes and your mood! How many light settings does this lamp have? The lamp has five brightness presets accessible with a tap of the slider control, or slide your finger right or left over the same control to adjust brightness. Combined with stepless color temperature adjustment from 6500K to 2700K, the customized light settings are limitless. To tailor your light hue to your needs, just touch and hold the power button to cycle between warm, cold, or neutral lighting. Does the lamp's exterior have color options? It does! Order your lamp in black, white, or silver for a contemporary minimalist look. Is the lamp head adjustable? The E3 Desk Lamp's head features an adjustable tilt up and down, to cast a wider or more narrow beam on your room or work area. How often will I need to change the lightbulb? You won't have to change any lightbulbs--the lamp illuminates your workspace with energy efficient LEDs for 30,000 hours, enough for many years of well-lighted work and leisure. What other features does this lamp have? Tucked away in the sturdy aluminum construction, at the back of the lamp's base, is a discreet USB charging port for your phone, headphones, and any other device you want to charge at your desk. Save your computer USB outlets for all your peripherals, and keep your favorite device charging close at hand. Match your E3 LED Desk Lamp to your office decor or desk frame, with a black, white, or silver finish. Relieve your eye strain with a stylish lamp that's also easy on the eyes. $59.00 List Price: $79.00* The list price is the same as the MSRP (Manufacturer's Suggested Retail Price). It may not necessarily be the price at which the product is sold.